Home / Islam / Which is the First Surah in Holy Quran? Question: Which is the First Surah in Holy Quran? Holy Quran has 114 Surah for the guidance of Muslims. All the Surahs are in somehow unequal length. 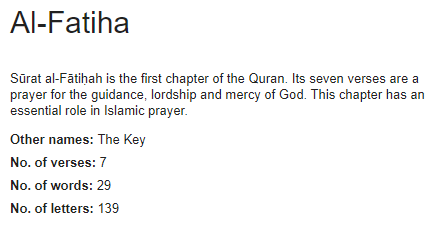 In the 114 chapters in the Quran, 87 are classified as Meccan, and 27 are Medinan. Sūrat al-Fātiḥah is the first chapter of Holy Quran. However, it is based on seven verses. It is completely based on the guidance for Muslims as well as lordship and mercy of God. This chapter is playing an important role in the Islamic prayers. The literal meaning of the Surah expression means “The Opener”. Hence, this is for the reason that this Surah is the opener of Holy Quran. It is a Meccan Surah. It is also known by the names of Umm Al-Kitab (“the Mother of the Book”) and also Umm Al-Quran (“the Mother of the Quran”). Al Hamd is another name of Surah Al Fatha which means Praise. This is for the reason that Hadith was narrated by Muhammad by saying: “The prayer [al-Fātiḥah] is divided into two halves between Me and My servants. When the servant says, ‘All praise is due to God’, the Lord of existence, God says, ‘My servant has praised Me’.” You can also find here which surah in Quran starts without Bismillah. One hope that you gets an answer of the question Which is the First Surah in Holy Quran?